On Friday February 8th Contship welcomed a group of students from GEMOS – the Global Executive Master in Operations and Supply Chain Management, accompanied by Prof. Roberto Cigolini. The GEMOS Master is a twelve-month long part time program taught on campus at two European schools, MIP, Business School of Politecnico di Milano and EADA Business School in Barcelona. The master is aimed at providing managers with the necessary tools for effective operations and supply chain management in today’s global competitive markets. The Contship Italia group has been involved in this project to provide students with the opportunity to learn more about the organization of the operations of RHM – Rail Hub Milano, as well as the integrated approach that characterizes the Group business model. The class attended a keynote presentation from Contship Marketing & Communications Director, Daniele Testi, who focused on the topic of intermodal corridors, intangible infrastructures supporting the flow of goods between gateway ports, intermodal hubs and final destinations inland. In the second part of the presentation, the focus moved towards the issue of digital transformation in the logistics sector. 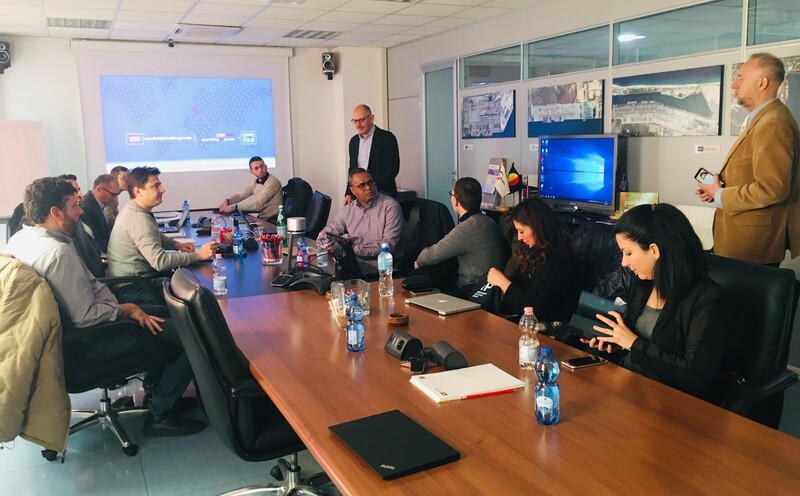 The day continued with Prof. Cigolini’s lecture, to then be concluded with the yard visit of Rail Hub Milano intermodal platform, which operates as a link between the main Italian gateway ports and some of the major intermodal hubs in Italy and Europe. Discover more about the GEMOS Master.